The original impetus for Saturn envisioned a brawny booster to launch Department of Defense payloads. The von Braun team at the Army Ballistic Missile Agency (ABMA) received money from the Department of Defense's Advanced Research Projects Agency to demonstrate the concept. Furthermore, von Braun's group eventually became the nucleus of NASA's Marshall Space Flight Center (MSFC). These convolutions and the vague outlines of evolving Saturn vehicle technology constitute the themes of chapter 2. The Saturn program eventually included three basic vehicles: Saturn I, Saturn IB, and Saturn V. Chapter 3 describes the events that led to these three separate rockets, whose configuration evolved out of the choice to go the moon by means of the lunar orbit rendezvous technique. MSFC began development of facilities to develop and test the mammoth boosters. Chapter 3 concludes with a discussion of the design and manufacture of lower-stage boosters for the Saturn I and Saturn IB. Early design and cost studies at ABMA suggested the possibility of using a single engine of 4 450 000 newtons (1 million pounds) of thrust, for which Rocketdyne Division of North American had made a feasibility study for the Air Force. Although this was an "Air Force engine," no other large propulsion system existed. The F-1 engine seemed unlikely to reach the point of full-scale testing for at least two years-too late to meet the accelerated booster development program of the Department of Defense. In any case, a booster with 6 700 000 newtons (1.5 million pounds) of thrust was needed, so the ABMA planning staff gave up on the simplicity of one large engine and turned to a combination of four smaller ones. Nevertheless, Super-Jupiter still remained a feasibility study, existing only on paper and within the fertile imaginations of von Braun and his group at Huntsville. The Department of Defense had its stated requirements for payloads of many tons, and ABMA had its proposals for possible booster configurations, but there was still no priority or money to get Super-Jupiter past the level of paperwork. The immediate catalyst came in the form of a new Department of Defense organization whose high-priority recommendations cut through layers of red tape and allocated dollars for converting studies into hardware-the Advanced Research Projects Agency (ARPA). Initiate a development program to provide a large space vehicle booster of approximately 1 500 000-lb. [6 700 000-newton] thrust based on a cluster of available rocket engines. The immediate goal of this program is to demonstrate a full-scale captive dynamic firing by the end of CY 1959. With the money they had left, ABMA went to work in Huntsville to decide how to allocate their scarce dollars for oversized test stands and to define the configuration of the tankage. An early decision was made to modify an existing test stand "out in our backyard," as Mrazek phrased it, keeping in mind that, although it had been designed to take Army missiles like the Jupiter 2.67-meter-diameter tank and a thrust of 734 000 newtons (165 000 pounds) the test stand had to be reworked to take a "monster" that was 24 meters high, 6 meters in diameter, and built to put out a thrust of almost 6 700 000 newtons (1.5 million pounds). The lean budget also had to cover a miscellany of items such as tooling to fabricate the oversized tanks and development of a thrust structure to take the maximum force of eight engines firing together at full throttle. There was also the need for oversized assembly jigs for manufacturing and checkout of the big new booster and for the costs of getting all the materials and the manpower to put the thing together. Like Rocketdyne, ABMA found that short funds made a virtue of scrounging in the dark corners of warehouses and stockrooms and puts a premium on imaginative shortcuts. A 1959 version of Saturn I is shown at the right. 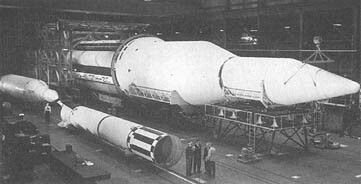 Redstone and Jupiter tankage (left) were combined in Saturn I's first stage. ....the booster program. Signed by Major General J.B. Medaris for AOMC and Roy Johnson for ARPA, the joint memorandum stated: "In addition to the captive dynamic firing..., it is hereby agreed that this program should now be extended to provide for a propulsion flight test of this booster by approximately September 1960." Further, the von Braun group was called on to produce three additional boosters, the last two of which would be "capable of placing limited payloads in orbit." Along with the new scheme came much needed funds. ABMA could now count on $13.4 million in FY 1959 and $20.3 million in FY 1960 for the captive firing test and first launch, in addition to $8.6 million in the same period for development of appropriate facilities. For the three additional flights by 1961, ABMA would receive as much as $25 million to $30 million. During April 1958, Eisenhower delivered the formal executive message about the national space program to Congress and submitted the Administration's bill to create what was then called the "National Aeronautical and Space Agency." The hearings and committee work that followed inevitably entailed revisions and rewording, but the idea of a civilian space agency persisted, and the old NACA role of research alone began to change to a new context of large-scale development, management, and operations. Congress passed the National Aeronautics and Space Act of 1958 on 16 July, and Eisenhower signed the bill into law on the 29th. During August, the Senate speedily confirmed Eisenhower's nominations of T. Keith Glennan as Administrator and Hugh Dryden as Deputy Administrator. At the time of his appointment, Glennan was president of Case Institute of Technology and had been a member of the Atomic Energy Commission. Dryden, a career civil servant, had been Director of NACA but was passed over as the new chief of NASA. The subsequent days and months included some jockeying and horse trading to establish the principal directives of the new organization. 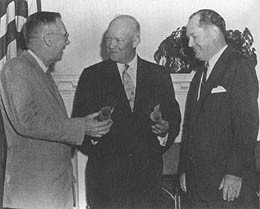 President Dwight D. Eisenhower presents commissions as the first Administrator and Deputy Administrator of the new National Aeronautics and Space Administration to Dr. T. Keith Glennan (right) and Dr. Hugh Dryden. NACA, for its part, had already been speculating about its role in the space program, and several committees had been at work in late 1957 and early 1958 studying the various factors a space program entailed: vehicles; reentry; range, launch, and tracking; instrumentation; space surveillance; human factors; and training. Late in March 1958, a NACA group studying "Suggestions for a Space Program" included notations for a launch program in January 1959 to put satellites of 135 000 to 225 000 kilograms in orbit (reflecting the earlier Department of Defense plans), and development of a rocket of 4 450 000 newtons (1 million pounds) thrust, as well as "development of hydrogen fluorine and other special rockets for second and third stages." The ABMA large booster program first entered NASA planning through the NACA Special Committee on Space Technology chaired by Guyford Stever. The Working Group on Vehicular Program included von Braun as chairman. Organized 12 January 1958, the Stever committee made its final report on 28 October, when NASA was already a month old.15 Von Braun's working group on vehicles had already made its preliminary report on 18 July. The language did not differ much from that of the final draft. The report began with harsh criticism of duplication of effort and lack of coordination among various organizations working on the nation's space programs. "The record shows emphatically," the report said, that the Soviet Union was definitely ahead of the United States in space travel and space warfare. During 1959, NASA began to cope with these issues. A plethora of committees, long meetings, and voluminous reports provided the milieu in which NASA and Department of Defense personnel came to agreement on booster priorities, upper stages, and the issue of high-energy propellants. In the process of settling these problems, NASA acquired its own in-house capability for the production of the nation's first large launch vehicles, to be known as the Saturn rockets. In a report prepared for President Eisenhower, dated 27 January 1959, NASA officially structured its own plan for a national space vehicle program. Attributed to NASA's propulsion staff, the document was prepared under the aegis of Abraham Hyatt, Chief of Launch Vehicles. The principal author was a NASA engineer, Milton Rosen. Preparation of the report included liaison with the Department of Defense, especially ARPA, the Air Force, and the Army to avoid duplication of effort and keep the Department of Defense informed of NASA's intentions regarding the use of military hardware. In its preamble, Rosen's report emphasized the lag in American rocket technology vis-a-vis the Russians and underscored the need for a new generation of large boosters. "The current group of booster vehicles, namely Vanguard, Jupiter C, Juno II, and Thor-Able, were all hurriedly assembled under pressure of meeting the threat of Russian Sputniks," the document declared, "and none of them possesses the design characteristics required by future needs of the National Space Program." A successful space program, in NASA's view, required three new classes of general-purpose launch vehicles. The first type included two versions based on the Atlas, one as a single-stage booster, and the other as a two-stage booster using the liquid-hydrogen-fueled Centaur as the second stage. The Centaur proposal had special significance, because liquid hydrogen (LH2) technology was recommended for inclusion in later designs. In fact, if high-energy liquid hydrogen fuel failed to become an operable technology, then the Rosen report predicated disappointingly low payloads in the future. The second group of boosters was keyed to the Juno V, the ABMA eight-engine cluster concept. NASA envisioned the Juno V as the first stage of a large multistage vehicle, requiring second and third stages to  make a complete booster, and the report proposed two different configurations. For the version known as Juno V-A, the NASA propulsion staff recommended adding the Titan I ICBM, itself a two-stage missile with conventional fuel, making a three-stage vehicle. For Juno V-B, the third (top) stage would be replaced with an LH2-fueled vehicle, probably the Centaur, to achieve higher escape velocities. Missions for the two Juno V variations included orbital research payloads, a five-man orbiting module, and unmanned lunar and other planetary missions using a fourth stage to gain escape velocity for larger payloads. The report further estimated that the Juno V configurations would be operational in 1963, with a useful lifetime of 5 to 10 years. During the course of the year, NASA's attention was directed primarily toward Juno V and Nova, although some name changes occurred. In February, the Department of Defense announced that the Juno V development program would henceforth be known as Project Saturn, with work to be continued at Huntsville under the direction of ABMA. The change in big booster nomenclature was consistent with von Braun's earlier inclination to refer to the clustered rocket as Saturn and logically followed the Jupiter vehicle in terms of christening boosters after successive planets in the solar system. The Saturn also reflected a proclivity within ABMA to name some boosters after ancient gods,23 such as Juno and Jupiter. The heart of the "von Braun team" that led the Army's space efforts at ABMA before transfer to NASA: left to right: Dr. Ernst Stuhlinger, Director, Research Projects Office; Dr. Helmut Hoelzer, Director, Computation Laboratory; Karl L. Heimburg, Director, Test Laboratory; Dr. Ernst D. Geissler, Director, Aeroballistics Laboratory; Erich W. Neubert, Director, Systems Analysis and Reliability Laboratory; Dr. Walter Haeussermann, Director, Guidance and Control Laboratory; Dr. Wernher von Braun, Director, Development Operations Division; William A. Mrazek, Director, Structures and Mechanics Laboratory; Hans Hueter, Director, System Support Equipment Laboratory; Dr. Eberhard F. M. Rees, Deputy Director, Development Operations Division; Dr. Kurt Debus, Director, Missile Firing Laboratory; and H. H. Maus, Director Fabrication and Assembly Engineering Laboratory. Roy Johnson, speaking for ARPA, emphasized the need for keeping the von Braun team together, particularly if a transfer occurred. "At Huntsville we have one of the most capable groups of space technicians in the country," Johnson said during congressional testimony in March 1959. "I think that it is a unique group... a national resource of tremendous importance." Then he added, "ABMA team is the kind of group that, if somebody had planned 10 years ago to create it, could not have been done better." Although Johnson told the congressional committee that he could work with ABMA in or out of the Department of Defense, he personally preferred it in the Department of Defense. The transfer of ABMA, Saturn, and the von Braun team was phased over a period of nearly six months. NASA's technical direction of Saturn dated from a memorandum signed by Glennan on 21 October 1959 and by the acting Secretary of Defense, Thomas Gates, on 30 October, and approved by Eisenhower on 2 November. The document affirmed continuing joint efforts of NASA and the Department of Defense in the development and utilization of ICBM and IRBM missiles as space vehicles. Pointing out that there was "no clear military requirement for super boosters," the memorandum stated that "there is a definite need for super boosters for civilian space exploration purposes, both manned and unmanned. Accordingly, it is agreed that the responsibility for the super booster program should be vested in NASA." Dedication of the George C. Marshall Space Flight Center. In the foreground with the bust of General Marshall are NASA Administrator Glennan, President Eisenhower, and Mrs. Marshall. The last months of 1959 could be called a watershed period for NASA in many respects. The agency had acquired the von Braun team and sharpened the focus on upper stages for a multistage vehicle. In December, a critical judgment on the application of high-energy propellants for Saturn's upper stages was in debate. The issue of high-energy propellants centered on liquid hydrogen in combination with liquid oxygen-and the use of liquid hydrogen (LH2) did not have the wholehearted support of von Braun or his staff at Huntsville. At NASA Headquarters, on the other hand, Abe Silverstein and several others were convinced that LH2 was the key to future Saturn success. Silverstein had joined NACA in 1929, and worked in wind tunnels at the Langley Laboratory. When the Lewis Propulsion Laboratory was formed in Cleveland, Ohio, in 1943, Silverstein joined the new organization and became its Associate Director in 1952. He had come to Washington in 1958 to become Director of Space Flight Development. For the next three years, Silverstein played an important role in policy decisions at NASA Headquarters before returning to Cleveland as Director of Lewis Research Center. Next, von Braun had to convince his colleagues back at Huntsville. Before the committee adjourned, von Braun telephoned the Redstone Arsenal to talk to Mrazek, one of the key team members who had come with him from Germany, and the two men brainstormed the possibilities. Abe Silverstein, NASA's Director of Space Flight Development, is shown touring a rocket engine facility. In the course of the deliberations of the Silverstein committee, three types of missions for the Saturn vehicle emerged. First priority was given to lunar and deep-space missions with an escape payload of about 4500 kilograms. Next in order of priority came satellite payloads of about 2250 kilograms in a 24-hour equatorial orbit. Finally, the committee considered the possibility of manned missions involving the Dyna-Soar program, in which a two-stage vehicle would be used to put 4500 kilograms into low orbit. On the basis of these assumptions, the committee stressed the evolutionary pattern of Saturn development and its potential for a variety of future roles. "Early capability with an advanced vehicle and possibilities for future growth were accepted as elements of greatest importance in the Saturn vehicle development." Once more, the Saturn Vehicle Team reviewed the wide array of potential configurations, reduced the number of choices to six, and began to weed out the least promising. The A-1 version, with modified Titan and Centaur upper stages, would provide the earliest flight schedules and lowest costs with existing hardware. It was rejected because it could not meet lunar and satellite payload requirements and because the slender 3-meter-diameter upper stages were considered to have potential structural weaknesses. The A-2 type, with a cluster of Intermediate Range Ballistic Missiles (IRBMs) in the second stage, also saved money and promised early availability but did not have the capability for some of the planned missions. A proposed B-1 vehicle met all mission requirements but needed a totally new stage with conventional fuels. The B-1 type was expensive, would take a lot of time to develop, and had some shortcomings for advanced missions. Moreover, all first three candidates needed high-energy propellants in the top stage. So why restrict the promise of LH2 to the top stage alone? "If these propellants are to be accepted for the difficult top-stage applications," the committee concluded, "there seem to be no valid engineering reasons for not accepting the use of high-energy propellants for the less difficult application to intermediate stages." The Saturn family of rockets finally envisioned by the Silverstein committee included C-1, C-2, and C-3, all with LH2 in the upper stages. The three-stage C-1 met the mission requirements and used Centaur engines in the LH2 upper stages. The second stage had four uprated Centaur engines, designated the S-IV stage, and the S-V top stage was the Centaur itself, with two engines. The hop-scotch numbering occurred because of the "building block" concept, in which hardware was used as available, the concept, was tested, and then newer and advanced stages were incorporated in the next major configuration. During C-1 development and flight, for example, a new S-III stage for Saturn C-2 would be prepared with the use of a newer, more powerful generation of LH2 engines. As the development and flight test of Saturn C-2 proceeded, the S-II stage would be worked up with four of the newer LH2 engines. The final C-3 vehicle would stack all the various stages together as a five-stage booster. Further, the Saturn Vehicle Team suggested that the first stage of the C-3 model might even include an F-1 engine to replace four of the cluster of eight uprated H-1 engines. With in-house capability established, in the form of the ABMA transfer, and with immediate vehicle guidelines established as a result of the Silverstein committee, NASA now proceeded to refine its priorities and goals. Two summary charts from the Silverstein report. Virtually all of our key programs presume a scheduled progress in launch vehicle and spacecraft development. These major developmental tasks frequently require time periods of 5 to 6 years for completion and can be substantially longer under given circumstances of technological progress and research availability. Thus, although the usefulness of highly tentative plans might be questioned, long-term objectives, on the order of 10 years in advance of today's program, are essential to keep our development activities properly focused. As a prelude to the ambitious moon missions, a lot of basic research had to be integrated into the plans for the launch vehicle development. Guidance and control was one area singled out for special attention, requiring advances in the state of the art in accelerometers; in cryogenic, electromagnetic, and electrostatic support systems for gyros and attitude control; inertia wheels; in long-life gyro spin axis bearings. The long-range plan noted research challenges in terms of heating and other aerodynamic problems, along with mechanical, hydraulic, electrical, electronic, and structural difficulties. The space environment created a wide range of potential trouble spots in metals, plastics, seals, and lubricants. 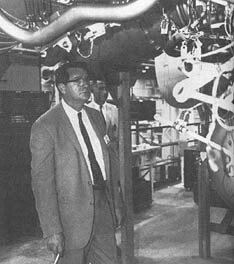 The scaled-up size of Saturn and Nova suggested difficulties in devising adequate automatic test equipment and techniques for the fabrication and assembly of oversized components. The long-range plan provided the opportunity to look ahead and anticipate these problem areas, giving NASA designers and engineers the chance to start working on solutions to these and other problems that were sure to crop up in the course of launch vehicle development. But NASA was not entirely free from difficulties. NASA Administrator Glennan departed NASA at the end of the Eisenhower Administration and resumed his position as president of Case Institute. Several weeks passed before President John F. Kennedy's new Administration settled on a successor. Lyndon Johnson, the Vice-President, still played a strong hand in space program planning, and favored someone with strong administrative credentials. Other advisers contended that NASA needed a technical man at the helm. As the Kennedy Administration prepared to take over early in 1961, the space agency received some hard knocks from the President-elect's science advisor, Jerome B. Wiesner, of the Massachusetts Institute of Technology. Kennedy announced Wiesner's appointment on 11 January and released the "Wiesner Report" the next day.62 Officially titled "Report to the President-Elect of the Ad Hoc Committee on Space," the report gave due credit to the "dedication and talent" that had achieved notable advances in space exploration during the past few years but implied deficiencies in the booster program. "Our scientific accomplishments to date are impressive," the document observed, "but unfortunately, against the background of Soviet accomplishments with large boosters, they have not been impressive enough." For several weeks, contact with the new Kennedy Administration was  haphazard. The Wiesner report aroused real concern among NASA personnel; there was a definite feeling that the report was neither fair nor carefully prepared. The issue of NASA leadership was resolved in February, when James E. Webb was nominated as Administrator. Vice President Johnson had found the managerial talent he wanted. A lawyer and ex-officer in Marine Corps aviation, Webb had headed the Bureau of the Budget and served as Undersecretary of State during the Truman Administration. At the time of his appointment, Webb was actively involved in the management of large corporations and was an active member of several professional administrative and policy organizations. Webb was sworn in by 14 February, with Dryden again as Deputy Administrator. Members of the Wiesner committee were subsequently given a deeper insight into the NASA program and organization that produced a much more positive feeling on their part. The organizational structure of the space agency was indeed firmed up, and a healthy rapport was established with the new Administration. The successive achievements of Russian efforts in space exploration early in 1961 not only intensified NASA's plans in astronautics, but also influenced President Kennedy's commitment to a more active program by the United States. The day after Webb and Dryden were sworn in, the Soviet Union launched a probe to Venus from a space vehicle in a parking orbit; Kennedy remarked at a public press conference that the Russian lead in space boosters was "a matter of great concern. "65 Then, on 12 April, while Congress was debating additional funds for NASA's budget in the coming year, a Russian booster put Yuri Gagarin into Earth orbit-the first human to orbit the Earth. On the evening of the following day, President Kennedy hosted a meeting at the White House, inviting Webb, Dryden, Wiesner, Theodore Sorensen, and several others, including  a reporter, Hugh Sidey, from Life magazine. The conversations revealed Kennedy's considerable concern about the Soviet Union's growing preeminence in space. The President speculated about the steps the United States could take to improve its own activities and about the costs involved in an accelerated program. Dryden observed that it might cost up to $40 billion to fund a program to land on the moon before the Russians, and even then, the Russians might make it before the Americans. But the President clearly wanted action. "There's nothing more important," he was remembered as saying.66 Not long afterward, in remarks to the Congress, Kennedy firmly asserted that it was "time for this nation to take a clearly leading role in space achievement, which in many ways may hold the key to our future on Earth. "67 Shortly thereafter, Kennedy instructed Johnson and the Space Council to study space projects that would give the United States a visible lead in space exploration. Haltingly, a national space program coalesced around a new entity, the National Aeronautics and Space Administration. After turning to the Department of Defense for its large boosters, funded through ARPA and under development by ABMA, NASA realized the need to control its own booster program when the Saturn project was nearly canceled owing to budgetary cross-currents. The eventual transfer of the von Braun team and the Saturn booster was a significant step forward for NASA. During 1959-1960, important agreements on upper stages and the use of high-energy LH2 technology were also worked out, capped by President Kennedy's decision to achieve a manned lunar landing within the decade of the 1960s. The next moves required decisions on mission profiles and production facilities.